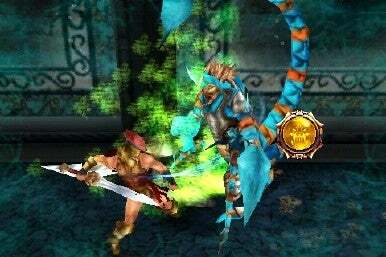 Hero of Sparta is a hack-and-slash action game from developers Gameloft. Already generating a lot of buzz, this highly acclaimed 3-D Grecian epic lives up to the hype and sets a new bar for graphics and gameplay on the iPhone platform. Gameloft is rapidly becoming a developer that people should pay attention to; they’ve now scored two solid hits with their Hero of Sparta action-adventure game and their classic sports-sim Real Soccer 2009. Hack and slash your way through mythological landscapes in this fast-paced action game. Hero of Sparta tasks you with guiding the Spartan soldier Argos in his odyssey to return home. But before doing so, a deity requires him to pass certain tests, kill some demons, and oh yeah, travel to Hades and back. Along the way you’ll have to solve basic puzzles and slay a horde of iconic bad guys straight out of Grecian myths — centaurs, Cyclops, minotaurs, etc. The 3-D graphics are pretty impressive for the iPhone and the settings, combat-style, and villains remind me of a more pedestrian version of God of War. The game uses the iPhone’s touchscreen technology to create a modified console-like game controller. A few buttons sit in one corner while another button acts as a joystick. It takes a few minutes to get used to it, but it rapidly becomes second nature to use the iPhone in such a way. When obstacles occur that require you to jump, an additional “jump” button appears and the game continues on. Hero of Sparta relies heavily on quick time events in combat. The moments in battle require you to touch a certain part of the screen in a timely fashion in order to execute a killing move. Most of the bigger baddies can be killed in such a fashion, and all of the bosses require quick reflexes to execute the moves. The moves are pretty fun to watch the first few times, but they don’t change when you acquire different weapons and become a distraction that breaks up the flow of battle later on. While you acquire less orbs for doing so, it’s often just easier to kill baddies the old fashion way rather than entering the quick time menu. The environments of the game range from lush gardens to fiery pits of Hades to the lost city of Atlantis. The combat is standard hack-and-slash fare with power moves, blocking, unlockable weapons and the previously-discussed quick-time events. Just as the combat becomes monotonous, the game often rewards you with a new weapon (which can be upgraded by using red orbs collected from dead enemies). They weapons are thankfully varied enough to change your strategy slightly to adjust to the weapons’ new strengths and weaknesses. For instance, the axe is a great power weapon but isn’t as strong on defense as carrying a shield and sword while the bow has great range but drains your energy meter quickly. While the plot is clichéd, the soundtrack is thin, and the combat can’t compare to higher-end console games, Hero of Sparta is one of the most entertaining and well-developed games I’ve seen for the iPhone. Each of the eight levels takes anywhere from fifteen to thirty minutes to complete, but if you only have a short time to spare there are frequent checkpoints you can pick up your game from. Each mission is challenging enough on harder modes to keep you coming back for more. You can always reload completed levels to gain additional red orbs or treasures and there are multiple difficulty settings to complete and challenge yourself with. For people who thought that the iPhone could never produce a quality action game with great controls, beautiful visuals, and fun combat — Hero of Sparta is a razor-sharp rebuttal.